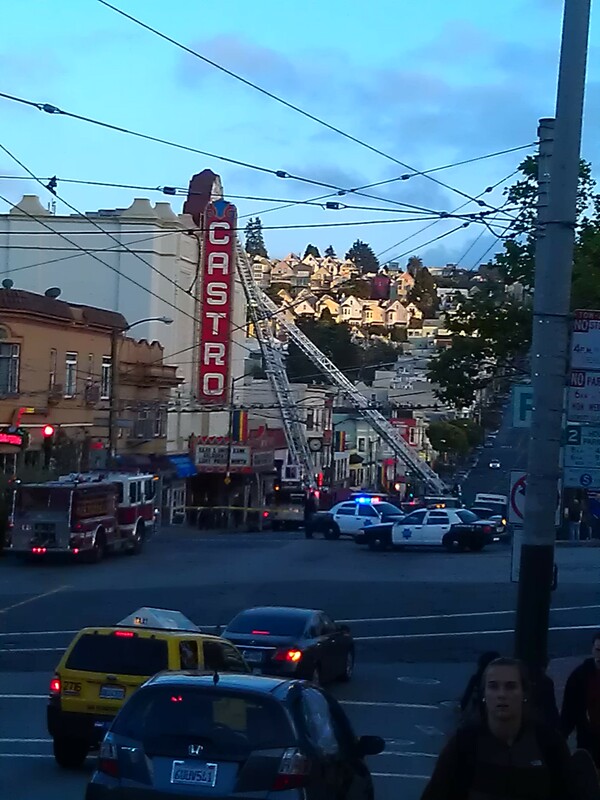 Fire trucks and ladder in front of the Castro Theatre Monday night. It’s not a sight you want to see. As I came out of the Muni underground at Castro Street earlier this week, police cars were blocking traffic at the corner of Market and Castro, and three fire trucks and their crews were busy in front of Timothy Pflueger’s famous Castro Theatre. Two long ladders were stretched all the way up to the roof of the 1922 building. A big crowd of concerned neighbors stood anxiously watching the drama from across the street, even though smoke was no longer visible. Rafael Noz, who lives in the Castro, called the theatre “the cathedral of the neighborhood” and he was thankful that the San Francisco Department had the fire under control. 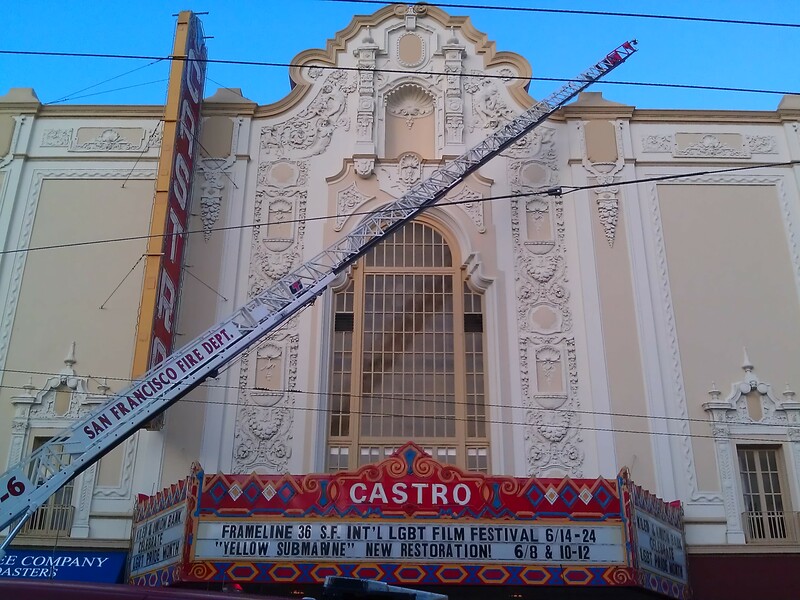 Neighbors in the Castro and worldwide fans of the theatre, which is still owned by the Nassers, the original family who commissioned it, are thankful to the SFFD, and to the vigilant neighbor who called in the emergency, helping avert a major tragedy. Luckily, the fire was restricted to the concrete exterior rear wall, facing neighbors on the street behind, so a bit of outside smoke was the extent of the damage. Firemen forced open the South alley rear stage door to gain access to the back wall. The door is steel and non-historic. That door does not give access to the outside rear wall, but the firemen could not have known that. Their only option was going over the fences and going through the house back yards behind the theatre. Hi David. Thanks for the additional info on the fire. Wow did not know all that about the SFFD having to go through the rear stage door. Guess it’s lucky it was not historic. I hope there is not another arsonist in the area.